Have you ever wanted to make bakery-style muffins at home? Sure, you can go out and buy fancy muffins, but muffins are very easy to make in your own kitchen. And, there is nothing better than adding a small pat of butter to a warm fresh-out-of-the-oven muffin. 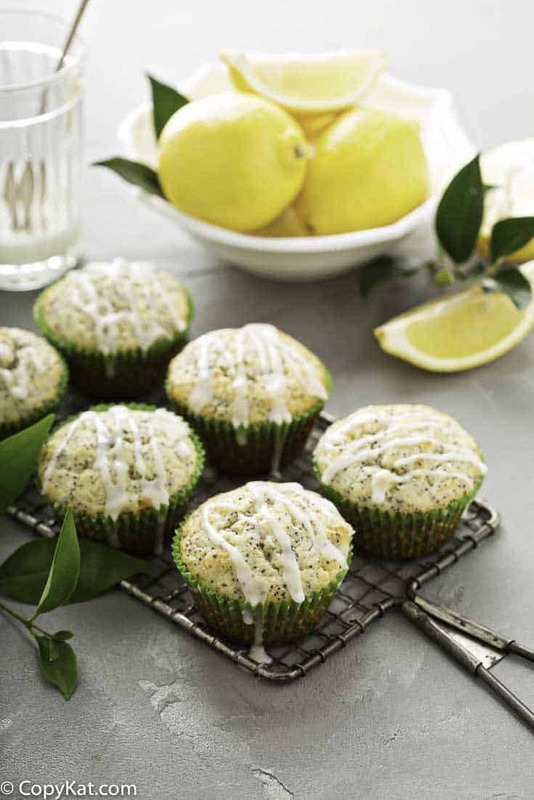 Enjoy these easy bakery-style lemon poppy seed muffins when you make them from scratch. 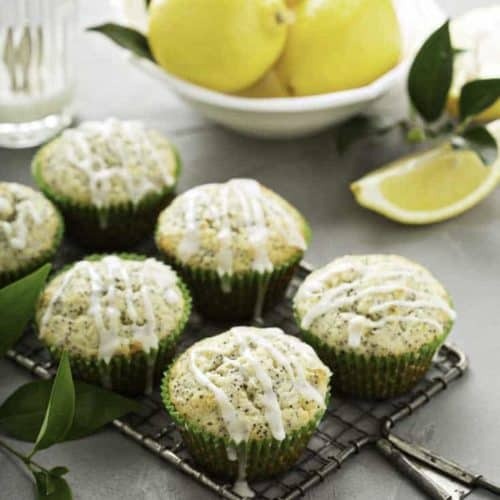 What Makes Lemon Poppy Seed Muffins so Tasty? These muffins are the perfect marriage of flavors – fresh lemon zest, vanilla extract, and lemon extract. For this recipe, we are using butter and sour cream to make these muffins tender and moist. These muffins will stay fresh for a couple of days after baking them. When we think about these tiny seeds, we most often associate them with bagels and breads. But, poppy seeds can add great flavor and crunch to all kinds of foods. And, they provide some respectable health benefits as well. Some suggestions to incorporate poppy seeds into your diet include adding them to rice dishes and salad dressings. Take up the challenge and add a teaspoon of poppy seeds to your day! Start with ingredients at room temperature – when the ingredients start from room temperature, the leavening ingredients can do their job, and really raise up your muffins high. Don’t overmix the batter – mix just enough to moisten all ingredients, any additional mixing may make muffins tough. The batter should be stiff enough to hold a spoon upright – If your batter is too thin, add a tablespoon (or two) of flour to help thicken the batter. If using fresh fruit toss with a tablespoon of flour before adding to the batter – coating fruit with flour will keep your fruit from sinking to the bottom of the muffin. Grease the entire muffin tin – Don’t skip on greasing the entire bowl of the muffin tin, they will release easier if grease the entire tin. Fill the muffin tin 2/3 full – Do not overfill the tin or when the batter rises during cooking, it will spill over the top. On the other hand, underfilling may mean your muffins will be tough and overcooked. Don’t overbake the muffins – Overbaking muffins can make them tough. To check for doneness, use a toothpick. When a toothpick is inserted, it should come out clean. Allow muffins to cool in the pan before removing – Allow muffins to cool for about five minutes before attempting to remove them. They won’t break apart if you do this. These is no doubt you will fall in love with these flavorful muffins! – be sure to try these favorite recipes. 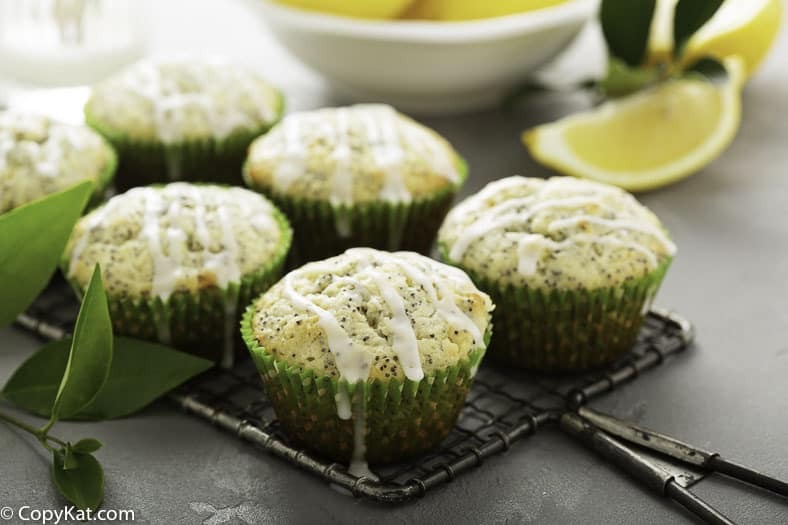 Enjoy these easy bakery style lemon poppy seed muffins when you make them from scratch. Grease a muffin tin, and use muffin papers if desired. Set muffin tin aside. With a mixer cream the sugar and the butter together. When light and fluffy add lemon extract, vanilla extract, and eggs. Beat together until well blended. Add lemon zest, sour cream, and poppy seeds. Mix until all ingredients are just blended in. In a separate bowl combine flour, baking powder, and salt. Stir until the mixture is uniform. To combine the dry ingredients with the creamed butter, add a third of the flour into the butter, and then add about a third of the milk. Stir gently, then add in the next third of the flour and milk, and stir gently. Scrape the sides of the bowl to make sure all ingredients are well incorporated. Add remaining flour, and then the remaining milk. Stir until just blended. Fill each muffin tin 2/3 full. Bake muffins for 24 minutes. You may want to start to check the muffins at about 20 minutes by inserting a toothpick to see if they are done. When the toothpick comes out clean, the muffins are done. Remove from the oven. In a small bowl combine powdered sugar, milk, lemon extract, and lemon zest. Stir until well blended. When the muffins have cooled to room temperature, you can drizzle the glaze over the muffins. These were great the 2nd day! Is there a way to use lemon juice in place of lemon extract? The fastest way to please my family it to make muffins for breakfast! These were so tasty! Making these again this weekend.